First, please check our Answers to Frequently Asked Questions. If you can't find the answers you need, please ask in an email to questions@bruinbond.com. The primary focus of the bond issue is to compensate for huge cuts in state funding since 2009. The district suffered multiple state revenue shortfalls in 2016 and cut 5% of its teachers as well additional administrators and support staff. The bond will allow the district to shift more operational costs from its general fund to bond issue funds to hopefully prevent additional staffing cuts and increases in class sizes in 2017. The bond expands on operational funding already being provided via a 2012 bond issue and extends that expanded support for two additional years. It is projected that 15 or more teaching positions can be preserved from future cuts by shifting operational costs to bond funds. The bond will provide students with the instructional technology other districts now offer but which our students lack. Since the state has now cut all textbook funding, the bond will provide both physical and digital textbooks. The bond will support and expand new STEM programs in Science, Technology, Engineering, and Math. It will also maintain buildings and update classrooms and their furnishings that are up to 99 years old. The bond will also provide improvements in existing facilities previously identified as top priorities by community members on the district's Long Range Facilities Planning Committee, but which bond capacity limits prevented us from addressing in the 2013 reconfiguration bond issue. On March 27 and April 24, the school board will hold public meetings at noon in the high school’s Hospitality Room to gather community input on the next bond issues. In 2016, Bartlesville voters overwhelmingly approved bond issues totaling $19.4 million over a five-year period. The primary focus was to compensate for huge cuts in state funding since 2009, including multiple state revenue shortfalls in 2016 which forced the district to cut 5% of its teachers as well as additional administrators and support staff. The bonds allowed the district to shift more operational costs from its general fund to bond issue funds to prevent additional staffing cuts and increases in class sizes in 2017 and beyond. The bonds expanded on operational funding being provided via a 2012 bond issue, extending that support across 2019-20 and 2020-21. While Bartlesville voters were willing to shore up the district’s finances, the statewide pressures reached a boiling point in the spring of 2018. The legislature, pressured by a statewide teacher walkout, finally raised taxes to fund a $6,100 average increase in teacher salaries. During the 8-day teacher walkout, Bartlesville community members and organizations supported teachers and students, including helping distribute meals and providing daycare opportunities. However, the increased state funding for schools was almost entirely devoted to salaries and, because of how the money was distributed, Bartlesville Public Schools did not actually receive enough funding from the state to cover all of the cost of the mandated raises. Consequently, the district still lacks sufficient operational funding. Only because Bartlesville voters continue to support local bond issues has the district been able to avoid the loss of fine arts, world languages, and similar electives which have been eliminated or reduced in too many other districts. Since bond issue monies cannot be spent on salaries or other non-capital items, the district has still been forced to cut staff in recent years as well as eliminate some elective programs such as Family and Consumer Science. It appears likely that in August district voters will be asked to consider additional bond issues to address the district’s ongoing operational needs and continue to update its bus fleet and facilities. The 2016 bond already funded the replacement of all buses older than 2004. The district will be seeking additional funding to replace 13 route buses that were purchased in 2009 or earlier, along with a few other vehicles, to boost the fleet’s efficiency and reliability. The district will also be seeking operational funding for technology, curriculum, and maintenance needs as well as safety improvements and a few high-priority facility projects. A significant curricular change funded by the 2016 bond issue is a Student Computing Initiative which is providing take-home Chromebooks to the students at Bartlesville High School. That program will extend to both middle schools in August and will be funding Chromebook carts at each elementary school. The 2016 bond also funds the purchase of both physical and electronic textbooks along with a variety of instructional and operational software. A new bond issue would seek to extend funding for those technology initiatives for two additional years and provide funding to replace the district’s electronic whiteboards in the elementary schools, many of which have been in use for a decade and are approaching their end-of-life, while maintaining the district’s technology infrastructure and services. Other operational needs funded by the 2016 bond issue which would be extended for two years by a new bond issue include funding for fine arts and athletics uniforms and equipment, science and STEM equipment, and a long list of maintenance projects needed at the district’s school sites. The newest site in the district, Jane Phillips Elementary, is 35 years old and the main buildings at the other sites are even older, with Central Middle School as the oldest operating school site; its western part was built 102 years ago. Regular maintenance is vital for the aging structures, and HVAC and lighting updates will be needed in the years to come to improve their efficiency. The public is welcome to attend the noon meetings on March 27 and April 24 in the BHS Hospitality Room to learn more about the proposed bond issues and provide feedback on their development. Renovating 7,000 square feet of existing spaces at Madison Middle School and Bartlesville High School to serve instrumental and choral music programs. Adding a bus loop at Madison Middle School, replacing part of its climate control system, and renovating its auditorium. Renovating the auditorium at Central Middle School, which was the only portion of that campus not addressed in a 2013 bond issue. Renovating existing spaces in the 1939 Phillips Field House and the 2009 Bruin Activity Center to provide dedicated spaces for the pom and cheer programs, a relocated athletics weight room, and more dedicated space for wrestling. Renovation of the lower level of Custer Stadium to provide locker rooms for soccer, track, cross country, and tennis. Resurfacing of the Doornbos Track at BHS and replacement of the decrepit tennis courts with a new and expanded facility. Adding a locker room at the softball facility west of Madison Middle School and renovating the baseball press box and locker rooms at Doenges Memorial Stadium. The district is always careful to budget sufficiently so that all promised facility projects can be completed. Once the above projects were completed and after ensuring bond issue funding was preserved for ongoing operational and maintenance needs, the district was able to fund the replacement of the turf on Lyon Field at Custer Stadium as described below. In February the new turf at the high school was completed. It replaced the turf installed in 2008 via a $650,000 donation from the Lyon Foundation, fulfilling the district's long-term commitment to the Foundation. Supt. Chuck McCauley shared, "We are very fortunate that the Lyon Foundation paid for the turf originally. The agreement was that the foundation would pay for it, and the district would maintain it and replace it when it was time.” Funding for the turf replacement came from the district's 2016 bond issue once all large promised facility projects were completed, while preserving bond issue funding for ongoing operational and maintenance needs. The new turf will make Bartlesville High School the first in the state to feature a shock padding underlay with AstroTurf Rootzone 3D3 Blend to provide better shock absorbency and protection for players. The shock pad will be installed between the sub-base layer and the turf and includes a 25-year warranty. Superintendent McCauley has stated, "I am really excited about the opportunity to install a shock pad and feel like this is the best product for our students." The new turf is the type that has been used for practice facilities at OSU and OU. The new turf logos use Lagoon Blue as a match for the light blue of the Bruins, navy blue, and white, with different shades of green every 10 yards. Since the photo below was taken, temporary soccer lines have been painted on the field for soccer season which will be renewed annually. In December the Bartlesville Board of Education approved a $452,000 contract with United Turf and Track of Edmond to replace the artificial turf on Lyon Field at Custer Stadium. The former grass Custer Field was renamed the E. H. "Ted" Lyon Field at Custer Stadium in 2008 in recognition of a $650,000 donation by the Lyon Foundation to install Momentum 41 artificial turf. That initial installation has reached the end of its projected ten-year lifespan. Supt. Chuck McCauley shared, "We are very fortunate that the Lyon Foundation paid for the turf originally. The agreement was that the foundation would pay for it, and the district would maintain it and replace it when it was time.” Drainage improvements made as part of the initial installation reduced the cost of the replacement, with funding for the turf replacement coming from the district's 2016 bond issue. The new turf will make Bartlesville High School the first in the state to feature a shock padding underlay with AstroTurf Rootzone 3D3 Blend to provide better shock absorbency and protection for players. The shock pad will be installed between the sub-base layer and the turf and includes a 25-year warranty. Superintendent McCauley has stated, "I am really excited about the opportunity to install a shock pad and feel like this is the best product for our students." The new turf scheduled to arrive on campus on Friday, January 25 is the type that has been used for practice facilities at OSU and OU. The district is wanting the new installation completed around February 23 before Bruin soccer starts in early March, with a $1,000 penalty option if the target date is not met. The new turf logos will use Lagoon Blue as a match for the light blue of the Bruins, navy blue, and white, with different shades of green every 10 yards. Instead of permanent soccer lines, temporary ones will be painted on for soccer season and should flake off with the weather over time. 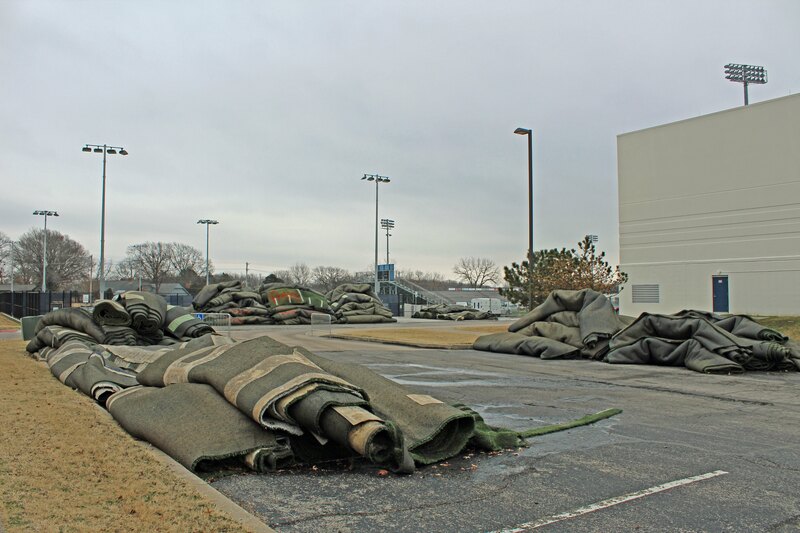 The used turf has been made available for uses around Bartlesville, with the city opting to take some for use at Price Field and other organizations taking advantage of the opportunity. In July 2018 the Bond Issue Oversight Committee toured the completed bond issue projects at Bartlesville High School, Central Middle School, and Madison Middle School. High School Band and Orchestra 9th-12th grade instrumental music programs were overflowing space built for grades 11-12 Reconfigured 1939 Phillips Field House to provide additional instrumental music room with adjacent storage. Room off Fine Arts Center lobby remodeled into Color Guard practice room. High School Choir 9th-12th grade choir program was overflowing space built for grades 11-12 Renovated former Fine Arts Center Flex Lab into an additional choir ensemble room. High School Physical Education, Wrestling, Pom, and Cheer 1939 Phillips Field House (old gym) was not configured well for current uses; physical education locker rooms were inadequate, wrestling needed more room, pom and cheer needed more appropriate practice spaces, etc. Reconfigured 1939 Phillips Field House to form better physical education locker rooms, larger wrestling room, and supporting offices. 1968 auxiliary gym remodeled into pom practice room with adjacent classroom remodeled into pom locker room. 1968 small gym remodeled. Reconfigured Bruin Activity Center (indoor practice facility) now has dedicated high-ceiling space for cheer program and space for athletics weight training. High School Soccer, Track, Cross Country, and Tennis Inadequate locker rooms Reconfigured bottom level of Custer Stadium to provide appropriate locker rooms for boys and girls sports. High School Track The Doornbos track, built in 1988 with some edge and marking renovations in 2004, had a worn out surface that had to be replaced. Track resurfaced by spring 2017. High School Tennis The five decrepit courts at BHS were the worst in the conference, with unsafe surfaces, inadequate seating, and too few courts for tournaments. Five courts demolished. Six new courts with seating and grassy side area constructed. High School Softball Softball field across town at Madison Middle School lacked a locker room; students traveled across parking lots to use old lockers in the Madison building. The only new square footage in the bond issue added an approximately 1000 square foot locker room at the softball field. That freed up space to allow Madison's locker rooms to be reworked to provide needed music practice and storage space. High School Baseball The district had been successfully operating and maintaining the stadium since 2015, while allowing other programs, including American Legion baseball, to use the stadium. The 2016 transfer of ownership from the city to the district allowed the district to capture lease revenue. The transfer of ownership did NOT increase operating costs for the district. In 2017 the stadium roof was repaired, joints in the stands were resealed, the HVAC was replaced, the lounge floor was leveled and old plumbing removed, and the pressbox and locker room were renovated. Via the 2012 bond issue, almost the entire building was renovated in 2015-16 and a new gymnasium was constructed. The 2016 bond issue allowed the auditorium to be renovated with audiovisual updates, plaster repairs, paint, new carpet, new seating on the main floor, and repairs to historic seating in the balcony, which had a glass safety rail added. All of the remaining original HVAC systems were replaced. The former shops were renovated into a commons with a bus loop drive. The auditorium seating was replaced, the stage repaired, and the audiovisual systems updated. The choir room was relocated and the former choir room repurposed for orchestra. The flooring, paint, and lighting were updated in the main gym and auxiliary gym. The cafeteria was repainted and new furniture provided. The office was also renovated. Bartlesville Public Schools has been working to improve its instructional technology, drawing upon bond issue funding approved by voters as well as community donations and federal grants. Here's an overview of the progress made since 2016 on the district's Student Computing Initiative, which is transforming the learning environment. In August 2016, district voters approved a bond issue that included funding to gradually deploy Chromebooks to all secondary students over four years. In fall 2016 the district purchased a dozen Chromebook charging carts with a total of almost 400 Chromebooks. The photo shows several of the high school teachers who volunteered to help wire up the carts. The carts have been used since then in the 10th, 11th, and 12th grade English classrooms. In 2016-2017, 29 teachers set up 52 online courses at the high school in its new Canvas Learning Management System. That year 1,222 students completed 2,321 assignments in Canvas and participated in 946 electronic discussions. This heavy adoption, before any take-home devices were deployed, was promoted by an online Kung Fu Canvas course of instructional videos and assignments, given inside of Canvas, to high school teachers. Teachers received instructional equipment incentives they could use in their teaching as they completed each of six phases of training, earning different Kung Fu Canvas "Belts". By May 2017, 88 teachers at the high school had earned three belts, completing the first half of that training, and they have the opportunity to earn the remaining belts this academic year. By the end of the first semester of 2017-2018, 34 teachers had completed the entire training course, earning all six belts. Granger Meador, who leads the program as the district's Executive Director of Technology and Communication, expects many more will continue working through the training this year, spurred on by equipment incentives, the opportunity to make up an inclement weather day via in-service points, and their desire to harness the new technology to improve their students' learning. This school year, 444 Chromebooks have been issued to freshmen for use both at school and at home. Each Chromebook has its own always-on case with a stitched Bruins logo. 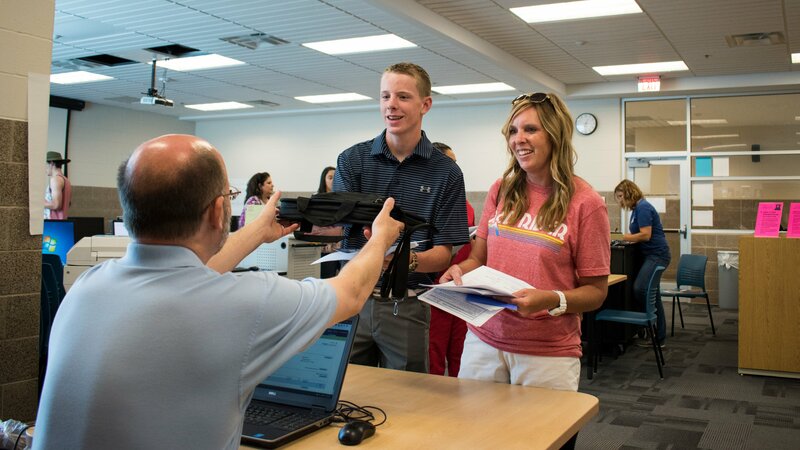 The take-home Chromebooks in the Freshman Academy and the Chromebook carts in the 10-12 English classrooms have led 69 teachers to offer 118 courses in Canvas to 1,677 students at the high school. Those students submitted almost 3,000 digital assignments in the first semester. Realizing that a $250 device with charger and carrying case that travels to and from school each day would carry risks of damage and loss, over 400 of the Freshman Academy students' parents opted to purchase a $25 annual insurance plan which provides full damage/loss coverage for a first incident and half coverage for a second one during the year. The district runs the insurance program and uses the premiums to operate its new Student Technology Support Team (STST) classes at the high school. Wendy Meador, a certified high school teacher who had previous experience in technical support and PC repair before she began teaching in Bartlesville in 2007, leads the STST. The class had six student technicians in its first semester and seven for its second semester. These students offered troubleshooting, maintenance, and repair for all high school Chromebooks, with about 1/4 of the freshmen using their services during the first semester. The student technicians have found that rebooting or reinstalling the Chrome operating system are the most common solutions for a mind-bogglingly diverse mix of user issues. Some Chromebooks suffer hardware failures such as power issues or cracked screens, like the one that STST member Andrea Hernandez prepares to replace in the photo below. The students created a video highlighting common issues. Ms. Meador reported that 7% of insured students had damage/loss incidents in the first semester, including 19 cracked screens. While Dell did not consider the glued-in screens replaceable parts, Ms. Meador used the insurance premiums to purchase replacements, and her students successfully repaired the devices. In the photo, STST members Olive Foust, Artturi DeBlieck, and Logan Gray are shown replacing Chromebook screens. Ms. Meador and her students also support technology throughout the school and assist with deployment and support of staff Chromebooks throughout the district. Current freshmen, sophomores, and juniors may apply to join the program next year, when the STST will be supporting over 1,600 take-home student Chromebooks at the high school, over 500 classroom-based student Chromebooks moving from the high school to the two middle schools, and about 500 Chromebooks used by staff members across the district. It was important for high school staff to have their own Chromebooks in 2016-2017 to help them train and prepare for using them in their instruction. Staff Chromebooks have also made meetings more productive and reduced wasted paper, promoting collaborative work on documents, presentations, and data analysis. In early January 2018, a federal grant allowed the district to purchase 340 Chromebooks for elementary and middle school staff members. To have them ready for the mid-January in-service day, in only four days the Student Technology Support Team, with the help of the district's Technology Services department one morning plus continuing help from high school librarian Kim Lashbrook and library aides, prepared the devices and outfitted them with cases, chargers, cleaning cloths, stickers, and instructional manuals. To help support this deployment, on January 15, 2018 district teachers provided over 21 different 50-minute technology training sessions to their fellow secondary school teachers. The topics included creating video lessons with a Chromebook, creating digital assignments and quizzes in Canvas, tips and tricks for using Chromebooks, and much more. The Chromebooks were kept a surprise for the elementary teachers. They received on-site training on their new Chromebooks, and were already putting them to use at staff meetings later that week. The January inservice day also provided additional teacher training on the STEM Launch computer science modules which are being piloted in all kindergarten through fifth grade classes. Those modules make use of equipment and iPad carts funded by earlier grants from the Bartlesville Public Schools Foundation and ConocoPhillips. Fundraising continues on a $100,000 goal of the Bartlesville Public Schools Foundation to support another set of iPad carts with Biomedical and Engineering modules for 2018-2019. After the second wave of iPad carts is put to use in the elementary schools in 2018-2019, the district expects to be adding a mix of classroom-based Chromebooks and iPads at each elementary school. At a recent school board meeting, Mr. Meador highlighted the efforts of Technology Services Director Lori Patterson and the eight technicians she supervises. They keep all of the technology in the district running, including the network infrastructure and services that make it possible for thousands of students and staff to use their Chromebooks, iPads, desktop computers, and printers. Ms. Patterson and the technicians support all sorts of technology beyond the obvious computing devices and their wireless and wired networks, including electronic whiteboards, telephones, clocks, intercoms, and security cameras. Needless to say, their expertise is greatly appreciated. 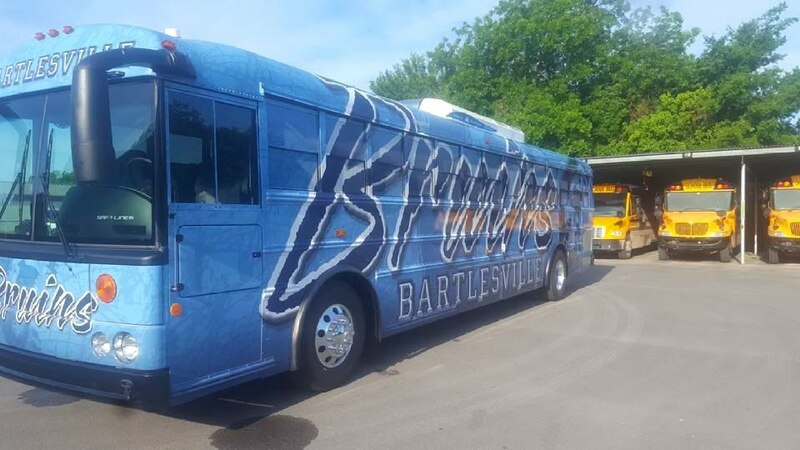 With the continued elimination of state programs for professional development due to inadequate funding, Bartlesville teachers have had to help each other in an era of constant technological change. Technology Services is assisted by teachers and other staff members at each school site who help troubleshoot and address problems, including teachers at the larger middle schools and high school who receive extra duty stipends as site technology assistants. Each school also has a teacher who receives an extra duty stipend to provide site-based technology training. Their efforts are coordinated by Laura Salzyn, one of the Teacher Specialists at the district's Education Service Center. Laura also assists with curricular assessments throughout the district. Angie Linthacum is the district's other Teacher Specialist. She assists with the STEM Launch program and also coordinates the district's English Language Development program which supports students coming from homes where languages other than English are used. Even in this era of inadequate state budgets, the support of our community and our talented students and staff are allowing us to modernize our schools. The district has made tremendous progress in its use of instructional technology since the successful 2016 bond issue. 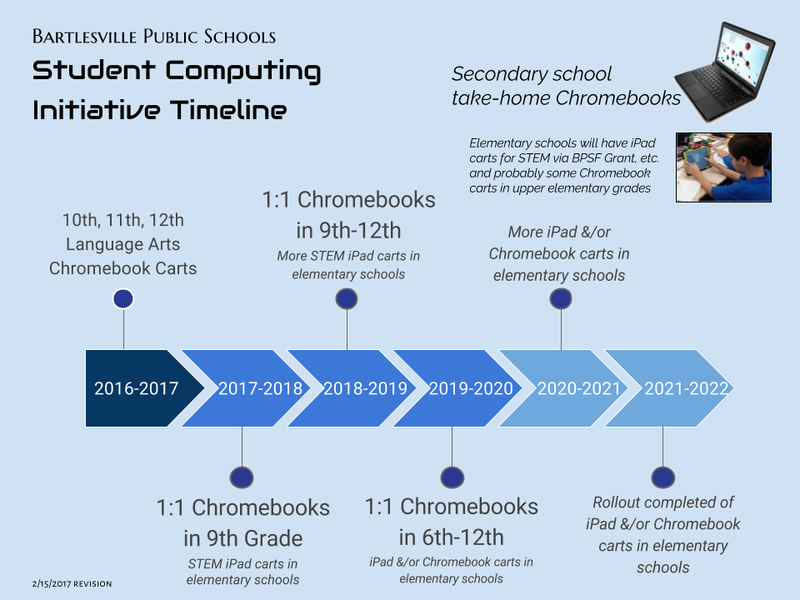 Continued support from district voters in future bond issues will be critical to maintaining the secondary Chromebook program and expanding the use of computing devices in the elementary schools. This is a long-term investment that promises great rewards in the years to come. Keleher Architects presented an update at the school board’s December 2017 meeting about various construction projects at each secondary school. These projects were all funded by the August 2016 bond issue. The main level of the auditorium has new seats. The historic seating in the balcony was retained, but a safety railing has been installed, with thick glass panels to avoid obstructing sight lines. Renovations continue in the bottom level of the stadium to finally provide locker rooms for track, cross country, tennis, and girls soccer while updating the visitor dressing room and boys football/soccer locker room. Flooring is being installed, including epoxy flooring in the new showers. Light fixture installations are almost complete, and painting is underway. Like the auditorium at Central, the one at Madison also has new seating. The new locker room and dugouts at the softball field are complete. Both gymnasiums have received some updates, with floors to be refinished over Winter Break.Renovations are wrapping up in a former locker room area to provide more space for the music programs. Part of it was used for a new choir room, with the former choir room renovated to finally provide a dedicated room for the orchestra program. The existing band room was also renovated. The remainder of the old locker room area has been reconfigured to provide music storage and practice rooms and renovated locker areas for physical education. Keleher reported that flooring is complete in most areas and there would be a punch-list walk-through once remaining doors and acoustical panels arrive and are installed. The Board of Education approved a change order to address issues with the asphalt drives at Hoover Elementary and adjacent Madison Middle School. The application of a second layer of asphalt was halted earlier this year when it became apparent that the first layer had deformed significantly despite the area having been prepared and passing previous soil compaction tests. Civil engineers were consulted and determined that subsurface water was flowing across the area atop buried layers of rock. They recommended that French drains be installed around the high side of the new drive at Madison as well as just north of Hoover Elementary to catch and divert the subsurface water, redirecting it to storm drains. The existing damaged asphalt will be removed, the French drains constructed and tied in, and then new asphalt will be installed. Despite this setback, the total cost of the construction projects from the bond issue remains within the originally budgeted amount. Many bond-funded projects have been going on in the district this summer. New buses and people-movers, furnishings, technology, and various renovations will benefit students when they return to school on Thursday, August 17. However, a primary focus of the August 2016 bond issue was saving teaching jobs and preserving class sizes amidst years of declining state funding for public schools. Thanks to the bond issue and the painful personnel cuts made going into the 2016-2017 school year, the district has not had to cut teachers nor student programs for 2017-2018. It also has rebuilt its fund balance to the minimum safe 7% level. This is significant, since during the 2017 fiscal year overall state appropriations to the district were down another $450,000, due to continued shortfalls in revenue. This was on top of years of prior reductions and shortfalls. An online slideshow documents the progress the district is making even in these difficult times for public schools, thanks to the continued support of local voters. A printable PDF version is attached to the end of this post. During the June 19, 2017 meeting of the Bartlesville Board of Education, Keleher Architects shared an update on the construction projects funded by the 2016 bond issue. The new softball locker room, the only new square footage in the 2016 bond issue, should be complete in July 2017. All 15 new route buses and one of two new activity buses have arrived. An additional activity bus and two people-movers, all with Bruins graphics, will arrive later. The activity buses feature large, comfortable charter-bus style seats, storage racks, individualized lighting, individualized air conditioning vents, and USB ports for the passengers to use for electronic devices. This will be a boon to students on long trips to and from away games. The second activity bus is scheduled to arrive before the end of June. The two people-mover mini-buses are out of the factory and are now receiving interior updates. The should arrive by the end of June. With most of the new buses in place, the district will be holding an auction on Friday, June 16, 2017 at 10 a.m. at Madison Middle School for 15 old but driveable route buses, 3 non-driveable buses, a couple of other vehicles, and the old graduation stage. The tennis courts were put into use by the team before the end of the school year, after the contractor conformed the fencing and surface markings to the plans. The windscreens are up and the lighting should become operational in the second week of June. The Bruin Activity Center renovations, which segmented the final bay of the existing facility into an weight room for the athletics program and a practice space for the cheerleaders, have come to a close. In the shots below, the only missing elements are some graphics. These two spaces now include full climate control, an improvement over the spaces they used to occupy in the 1968 additions to the 1939 Phillips Field House. The larger 1968 auxiliary gym can now be dedicated to the school's physical education classes, while the smaller gym, which for many years was a weight room, will soon be renovated into a practice space for the pom program. The heavy spring rains slowed its progress, but construction continues on the new locker room and dugouts at the softball field located at Madison Middle School. The locker room walls have been built, the dugouts are framed, and trusses are on site and should be installed soon. The locker room renovation at Doenges Stadium has been completed. The carpet in the press box has been installed and minor repairs to the walls are being done. The guest press box floor has been repaired. The recent bond issue projects at the secondary schools will reallocate and renovate over 7,000 square feet of existing space for the district's music programs. The start of summer break means five additional projects are now underway across the district. Extracurricular programs which have had inadequate spaces for years are benefiting from the construction and renovation projects. At Bartlesville High School, demolition has begun on areas of the 1939 Phillips Field House and one room in the 2004 Fine Arts Center to provide additional space for the music programs. Those programs increased in size at the high school with the addition of grades 9 and 10 to the campus in 2015-2016. The former FLEX computer lab in the Fine Arts Center will be renovated into an additional ensemble space for choir, while a ramp connection will be made in the existing band room into the adjoining 1939 Phillips Field House. The old auto shop in the field house later was a journalism lab and in recent years was used by the pom program. That area and an adjoining former classroom are being renovated into an additional instrumental music room and musical instrument and uniform storage. The Phillips Field House was already helping out the music programs. The 2013 bond issue for the reconfiguration to grades 9-12 at Bartlesville High School funded a renovation of the former training room on the lowest level of the southeast corner of the field house into a percussion room with a ramp leading up in the main ensemble room in the adjoining Fine Arts Center. Much of the remainder of the 1939 Phillips Field House and its 1968 addition will also be renovated to benefit a variety of athletics programs. The pom program will gain a locker room from a former classroom. The smaller auxiliary gym, which for years has been a weight room, will become a much-improved pom practice space. Various offices and locker rooms between the main gym and the north auxiliary gym will be renovated to improve the weight room area and locker rooms for physical education and provide improved locker room and other spaces for the cheerleading and wrestling programs. The wrestling practice room will be renovated and expanded. The renovations at Madison Middle School have also begun. They will bring improvements for transportation, climate control, the auditorium, and the music programs. A loop around the building will be constructed to separate buses from personal vehicles, improving traffic and safety before and after school. Buses will then be able to pick up and drop off at the commons area on the north side of the school, while parent pick-up and drop-off will remain in the loop drive off Baylor. The former Sooner High/Mid-High facility has never had separate rooms for band and orchestra, so the auditorium stage was in daily use for practice, impeding its other uses. The building of the softball locker room, which is the only new square footage in the entire 2016 bond issue, will free up space in the main building so that locker rooms just north of the auditorium can be reconfigured. The choir program will be moving to space in the reconfigured area, allowing the orchestra program to use the former choir room. The locker room area reconfiguration will also provide an additional breakout room and storage for the music programs, while still providing appropriate locker rooms for girls and boys taking physical education classes. The auditorium seats will be replaced with ones like those in the Fine Arts Center at the high school. The finishes and systems in the stage area and auditorium will be refreshed where needed. The original steam heating system, which has been serving portions of the site since it was constructed in the late 1960s, will finally be replaced with a modern and energy efficient system with on-demand heating and cooling. The auditorium was the only part of Central Middle School that was not renovated in the 2013 bond issue. Now the seats on its main level will be replaced with ones like those at the high school Fine Arts Center, while the historic seats will remain in the balcony. Plaster rot will be addressed, worn carpet replaced, and there will be a safety update for the balcony rail and updates to the audiovisual system. Previous bond issues renovated the corridors of the other four district elementary schools, but Hoover and Jane Phillips had not been refreshed. Paint and carpet and other finish refreshes will bring those sites up to par. Some exterior panel issues at both sites and a parking lot issue at Jane Phillips will also be addressed. Priority furnishings needed for Bartlesville High School, Central Middle School, Madison Middle School, and Richard Kane Elementary School should arrive in July. Worn carpet at many sites will be replaced. Shown here is a classroom at Richard Kane Elementary School with its new carpet. Bids were received in early June to replace the pea gravel at all of the elementary playgrounds with a safer modern material, and the deteriorated edge timbers will be replaced. Bids will be received in mid-June on the last major renovation project in the 2016 bond issue. The lowest level of Custer Stadium will be renovated to finally provide locker rooms for track, cross country, and tennis as well as space for girls soccer. Bids will be received in mid-June to build a loop drive around Hoover Elementary to improve traffic and pedestrian safety. Parents and students can get online help with the district's new Chromebooks at BPSCHROMEBOOK.COM. They can also get online help with the Canvas Learning Management System at BPSCANVAS.COM. Canvas will be available for students and teachers to use in grades 6-12 in 2017-2018. Online help is also available for the district's G Suite for Education. The 2016 bond issue also provided funding for a variety of technology improvements, focused on a Student Computing Initiative to phase in devices students can use at school and at home. In August 2017 all freshmen at Bartlesville High School will receive a new Chromebook. These cloud-based computers are inexpensive but powerful ways to modernize instruction. A parent or guardian must be present with each freshman student to check out the Chromebook. The first check-out will be after the Bruin Camp on Friday, August 4, with the remainder to be checked out on Thursday, August 10. On 8/10, Chromebooks will be distributed as part of schedule pick-up from 8:30-11 a.m. and from 12:30-3 p.m., with an evening Chromebook checkout from 5-7:30 p.m. In August the district plans to provide parents the opportunity to purchase Chromebook insurance online with a credit card. There will also be credit card, check, and cash insurance sales on the August 4 and August 10 pick-up days. The $30 insurance plan fully covers the first incident a student might have with accidental damage to a Chromebook, and covers half the cost of a second incident. A new Student Technology Support Team class at the high school will handle Chromebook repairs and usage issues as well as assist staff with various technology needs. More teachers will be using the Canvas Learning Management System to provide class calendars and assignments to students. All freshmen will begin submitting some digital assignments in their classes for teachers to grade online. Teachers can also use the district's G Suite for Education applications to allow students to complete some assignments while offline, uploading them when they return to campus. These devices will allow the district to gradually reduce its operating expenses for paper and physical textbooks, although some use of both will be retained. They will also allow the district to eventually phase out non-dedicated computer labs in the secondary schools. Whew! That's a lot to report on, with much more to come in the future. THANK YOU Bartlesville, for making this possible in this era of inadequate state funding for our public schools. Construction work on the new tennis courts at BHS will continue for awhile longer. In addition to finalizing the areas around the courts and laying sod, inspection of the fencing and court placement revealed some court and fence placements did not conform to the plans. So on May 1 the new courts will be closed so that corrections can be made. The cost of shifting the fencing and net poles and providing two new coats of court colors to match the placements in the specifications will be borne by the contractor. The district has been impressed by the quality of the materials and surfaces provided by the contractor. Superintendent McCauley said, "The contractor has been great to work with, and we are confident these fixes will provide us with superb courts for our tennis teams that match precisely with the bid specifications." This project is still coming in overall less than the original purchase order. Some work will be done in May to conform the new tennis courts to the plans. The new athletics weight room and cheer room in the indoor practice facility should receive occupancy clearance soon, after cleaning and clearing final punch list items. The work at the softball field west of Madison Middle School has been greatly slowed by spring rains. But new dugouts and locker room slabs have been poured and concrete block work is starting first on the dugouts and then on the locker room. Transportation Manager Orville Burks reported that four more new route buses arrived on Friday, 4/28. Bids have been received on the renovations for Madison Middle School and the auditorium seating projects at Madison and Central middle schools. The architects are working on contractor schedules. The architectural drawings for the driveways at Madison Middle School and Hoover Elementary School and for the remodel of the bottom level of Custer Stadium are 90% complete and should be completed in early May. Outside of the various construction projects, the prime motivation for the August 2016 bond issue was to shift some operating expenses from the district's general fund, allowing its fund balance to recover and to offset continued cuts in state funding. The funding collected since the bonds were sold in late 2016 has allowed $450,000 in general revenue expenses to be shifted to bond funds. This bond funding has helped the district absorb about half of the net state revenue reduction it is expected to suffer by June. Those revenue failures mean our district fund balance at the end of the fiscal year will be around 7%, whereas a few months ago we were on track to end at around 10%. The district is projected to lose $900,000 in state funding by the end of this fiscal year in June 2017. The overall loss is due to revenue failures in the state's 1017 Fund, which was established in 1990 as a dedicated revenue source by the HB 1017 school reform law. On April 27, 2017 State Superintendent Hofmeister announced that the state's public schools had lost $82 million since February 2017 and would lose over $100 million by June. This loss of funding is on top of the legislature's decision in May 2016 to eliminate all $33 million in textbook funding statewide and cut another $38 million in public schools activities funding, despite some politicians' misleading claims they held school funding flat and their failure to acknowledge that ever-increasing state enrollment means the budget would have to actually increase to keep pace. Regrettably, state leaders have repeatedly failed to address the structural deficit in the state's budget caused by repeated income tax cuts, various corporate and industry tax breaks, various off-the-top funding streams, and failure to budget for the long-term economic cycles of the petroleum industry. Instead, in recent years they have relied on one-time money, a state roads bond issue, and draining various fund balances to balance the state budget. The schools suffered repeated state revenue failures in 2016 and now that has recurred in 2017 because the various financial tricks are now played out, with fund balances so low that cash flow problems in the 1017 Fund now directly impact schools after their budgets are adopted and employee contracts are signed. So it has been up to the district and local voters to make up for the state's fiscal failures. The district is on track for over $1.3 million in personnel cost reductions in 2016-2017 and has implemented another administrative streamlining for 2017-2018 that should save an additional $160,000. The 2016 bond issue, which allowed $450,000 in general fund expenses to be shifted to bond funding in 2016-2017, will allow $700,000 to be shifted in 2017-2018. So the bond issue is why the district is not expecting other significant personnel reductions for 2017-2018, which will preserve programs and class sizes for its students. THANK YOU, BARTLESVILLE, FOR HELPING US WEATHER THIS STORM. However, unless the state addresses its revenue problems, we can expect additional staff cuts in future years and a worsening of the teacher shortage due to low teacher salaries. Head tennis coach Jeff Birk had some great news on Wednesday, April 19, 2017: the six new courts at the high school were ready for play. So that afternoon the tennis teams were out practicing on the beautiful new courts as workers continued to construct the center stands and other finishing touches. In December 2016 the school board awarded an $875,880 bid to Merritt Tennis Court & Track Systems to replace five decrepit courts in the same location just north of Lyon Field at Custer Stadium. The project was funded by voters as part of the August 2016 bond issue. The new courts feature walkways on the north and south sides providing access to a new seating area in the middle of the court complex. Wind screens on the north and south sides will eventually feature the Bruins logo. The courts meet USTA US Open specifications. The bid came in low enough that lighting could be added on six poles, operable by a cell phone application and with an auto timer. The former lower parking lot west of the courts will become a green space, with alleyway parking spots that have been repoured. This site does not endorse the bond issue, but provides facts to help voters make an informed choice. Every effort is made to ensure the information presented is as accurate as possible.